The 2010 NHL playoffs will always be remembered for the Philadelphia Flyers coming back from 0-3 deficit to win game 7. I was watching the game and saw the Boston Bruins take a 3-0 lead in the first period. Then I saw what was a brilliant leadership move. I have seen a lot of great Hockey Flyer games. 1987 when Rick Tochett scored 4 goals in a game, Ron Hextall when he scored a goal(he is a goalie), Eric Lindros era. The Philadelphia Flyers team is playing an away game they are down 3-0 in the first period. At that point it’s easy for the hockey players to give up at that point or keep playing lousy and give up another goal. Analyzing everything the team was playing at Boston they had come back from being down 0-3 to make it to game 7. The time out was the game changer. If Peter Laviolette doesn’t call a time out. I am sure flyers would have lost. 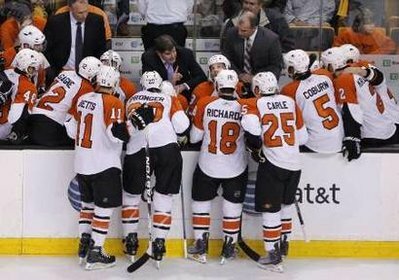 Peter Laviolette Philadelphia Flyers head coach at the time does what a great leader does. When you are losing or a challenge gets to challenging you call a time out. The purpose is to re-group or rejuvenate or simply adjust because something is not working out. The head coach calls a timeout where he makes the goal very simple “just get me one goal”. Get me one goal sounds more simple that saying get three goals. The message is simple when you are down stay focused it’s never over until the final buzzard. Do things one goal at a time. Calling a time out may be taking a quiet day to go away and get your mind and thoughts together or a few minutes. There is the big goal which is to win the game and move on to play for the championship. When you are down one goal at a time.